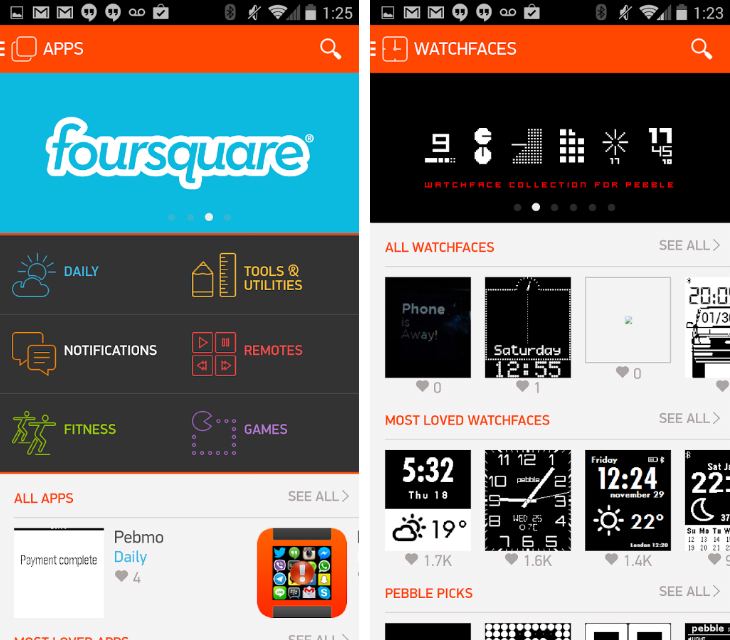 A little over a month since it debuted on iOS, Pebble is launching its long-anticipated appstore on Android. As promised, it offers a wealth of Pebble-supported apps and watchfaces with a polished interface that should be simpler and quicker to navigate. It includes the watchapp directory, which lets you search, discover and install new software for your Pebble or Pebble Steel smartwatch, in addition to a ‘locker’ where you can store and manage your existing apps and watchfaces. To coincide with the release, Pebble today announced three new app partners: eBay, Evernote and Time Warner Cable. The eBay app lets users review their feeds, discover new products and add them to a ‘Watch List’ for later bidding. Evernote, meanwhile, is a slimmed-down version of its mobile note-taking counterparts with quick access to checklists, reminders and notebooks. If you’re picking up the groceries or want to check you’ve covered everything in a meeting, this should give you the information you need at a quick glance. Lastly, Time Warner Cable is offering an app that gives its IntelligentHome customers the ability to control their home set up with a Pebble smartwatch. After Samsung’s unveiling of the Gear 2 and Gear 2 Neo, Pebble needs to reassure both new and potential customers that it can still offer the best software experience. The Pebble Steel is arguably the best-looking smartwatch on the market, but with new wearables rumored for Apple, Google and Microsoft, it’s promising to see that the smartwatch startup isn’t resting on its laurels.